Digitalization of education is a hot topic in the Netherlands. The coming years will show how the education will be digitalized and reformed; the window of opportunity is now open for forerunners. Not only have the Dutch achieved high levels of education, they also rank among the most skilled (OECD). On average 32% of adults hold University degree, and the Dutch adults are ranked third in literacy and fourth on numeracy of OECD countries. Early childhood education is widespread for 3, 4 and 5-year-olds, and has universal enrollment to school for 4-year-olds. The aging population of teachers, is an issue, as well as the number of part time teachers and lack of properly educated teachers. This is forming an extra pressure in the future for the now already high work pressure of teachers, especially in the lower education. New solutions are in high demand. The Dutch educational system divides children in educational levels around the age of 12. This means that a lot of testing is involved in the schools, especially the last few years of the primary school, to help to choose the appropriate level of secondary education/school type. It does have great influence on the decision-making process, but also creates prestige pressure for schools and children. In general, the Dutch secondary education system produces very good results and is ranked high compared to that of other OECD countries. Cloud computing: All the teaching materials always accessible, everywhere and safe. Devices: Many students/pupils have already now their own device that allows them to work on the cloud. Think of it as an iPad, Chromebook or Bring Your Own Device. Network structure is more and more often working seamlessly; wifi, digiboard, printers, etc., which are easily accessible via the Internet. Learning Analytics / Big Data will be more utilised; Collecting, Reading and Using Data from Students ELOs that can be used to support students better. Adaptive Digital Learning Material. Education becomes more personalized, so also the lesson material: it is customizable to the user. More possibilities for Personal Learning Environment through digital network. Technological developments will find their way to the education: programmers, virtual reality, augmented reality, smartwatches, artificial intelligence, drones, etc . Digital skills, new skills are being identified for the future generation, like computational thinking and coding are recognized to be needed. Making (MakerEd) things is getting important: 3D printing, Doodler, LittleBits etc. Dutch high education institutions score Top 2 in Europe, next to the Switzerland. Stress and work pressure is highest among the teacher population. Dutch educational organizations look for new, digital, solutions. Reputation of Finland is high on the edu-sector. Digitalization gives pressure also for the school curriculum. Success stories from Finland: Seppo, Kiva-koulu, Vuolearning. Mightyfier. Kiva-koulu is market leader in anti-bullying education. Change and opinion leaders are innovative teachers who are active in social media groups. Many students and children have own devices, mobile devices, digital tools. 35.000 foreign students in the Netherlands, and the number is growing as Finnish students ranked Netherlands as favorite study destination abroad. 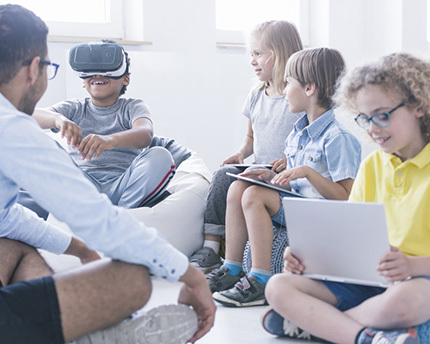 There are currently many schools in the Netherlands, that are interested to stand out from the others by trying innovative methods, tools or practices for learning. They have a clear need for offering 21st century learning. The traditional players on education content -the publishers- are usually large players with traditional methods and not agile enough to answer the needs of the education market. This creates opportunities for smaller players and startups. Finnish education and technology have a very good reputation in the Netherlands, and Finland is often used for benchmarking educational innovations. Even language is often not an issue in the piloting phase; there are enough educational organizations that use English as teaching language and are ready to test English versions in pilots. Due to our recent assignments and contacts in the Education Sector, we have up-to-date information on the educational market; we know the Dutch Educational system, structure and levels of education, as well as the purchasing models and value chain of the educational products. We have also access to local educational fairs, networks and major stakeholders. We know to advice how the innovative and digital solutions enter to the market and what are the customer pains in the educational institutions. It is relatively easy for us to build up a test team or contact suitable people to evaluate new solutions and or products for a quick market scan or test drive from Finland. We have been a part of a great success story on this industry once, we can do it again! Contact Petra Wullings for a chat about the Education Industry in the Netherlands, we are more than happy to help you! Keep posted about the business opportunity news in The Netherlands and receive all updated Fact Sheets in your mailbox.